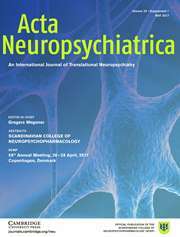 Acta Neuropsychiatrica is an international journal focussing on translational neuropsychiatry. It publishes high-quality original research papers and reviews. The Journal's scope specifically highlights the pathway from discovery to clinical applications, healthcare and global health that can be viewed broadly as the spectrum of work that marks the pathway from discovery to global health. The steps of translation that are within the scope include: 1) fundamental discovery, 2) bench to bedside, 3) clinical trials, 4) translation to clinical guidelines, 5) health policy and usage, and 6) global health. Research covering molecular biology, genetics, pharmacology, imaging and epidemiology is welcome as it contributes to enhancing the field. Inflammation and depression: a causal or coincidental link to the pathophysiology?